Suppliers of imported and South African manufactured sight glasses and flow indicators with the names Rhodes, Vista, Lake Monitor, Ajax, Flow-Mon, Flowpoints, and C-flo. Also Flow Switches, Flow Transmitters from Flow-mon as well as the full range of Apollo Flow instrumentation. Flocare started operation in 1984 with a portfolio of UK companies with Solids and Fluids handling expertise. Rhodes flow indicators and sight glasses are devices that enable a visual check if there is a flow of liquid through a pipeline. The pressure range available is from full vacuum up to 50 bar (higher available on request) with temperatures from -40 ºC up to 400 ºC possible. 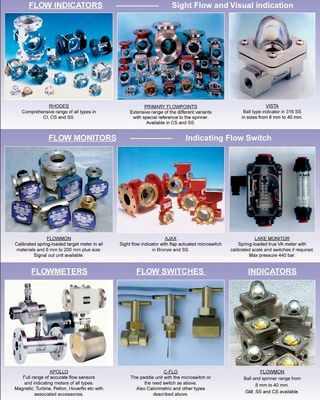 This historically popular range of sight flow indicators come with or without the flap actuated low flow micro-switch. This range of flowmeters will provide you with a highly accurate and economical way of measuring liquids over the range of 1 to 9000 litres/min. The RTB has an LCD display of flowrate and flow total. It takes the output from flowmeters and can be used for local or remote indication.